But requires knowledge of HTML when the gallery gets complicated, doesn't allow pagination and is using a table for non-tabular data. One prb i feel..only admin can watch that image gallery..but a register user or authenticated user can`t watch this gallery...any one help me? You will need to look at your access permissions for imagecache or any other module that deals with access. I'm sure it can be done, but I am not sure how. I am having an issue creating separate links to other image galleries from the original gallery. Basically I want to create an album. I did try your album tutorial, but it didn't turn out very well for me. If I could do this, it would be perfect. All help is appreciated. For your help I will reward you with a hug or a kiss, your choice. P.S. If there is a module out there that will give me similar results, that would be helpful too! I looked all over and I haven't found one that met my needs. The album tutorial is the one you want to follow. It's a good tutorial, i can followed this without any difficulties. But i have problem with the result. The images are shown in actual size instead of in thumbnail size. I wonder where's the problem. Could you please help me with this problem?? Cause i can't find the problem. Problem solved. 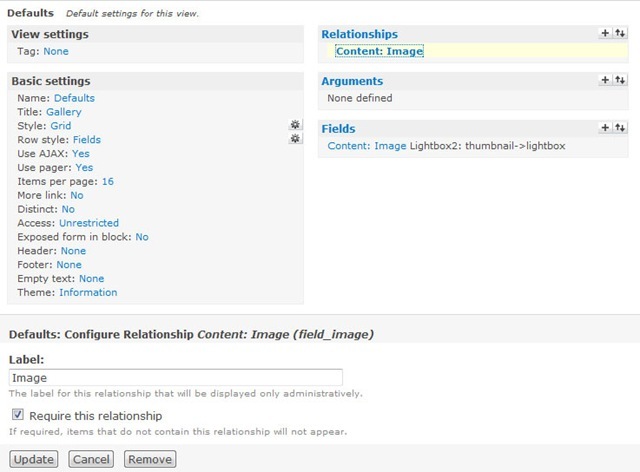 There's a mistake when choosing fields content:image. But, why the thumbnail got cut? How to make it is not cut but only resize. You will need to look at your view again and change the image display settings to thumbnail. Chose the scale option not scale and crop. Hi James, you kindly pointed me at another one of your tutorials for me to look at how to display a set of images associated with nodes. I'm making progress using this tutorial and have run into a problem that @Sandeep posted. I changed the view to thumbnail -> Original and got that to work. However, I don't see the thumbnails on the page, only the titles as links (which is all I got when I had it set to thumbnail -> lightbox. Any ideas as I don't think it's a memory problem that @Sandeep later posted. I assume you have enabled Clean URLs? Have you looked at the HTML source to see if the thumbnail image URLs are correct? I assume there is nothing in your report log in Drupal? I remember having this problem ages ago on a test site where it had worked before and ended up using Thickbox rather than Lightbox. Hi James, yes the URLs look as if they're right and I'll check the logs to see if I can pin it down further. With the thumbnail > lightbox set up, the imagecache path was shown but the images aren't being added so might be a permission thing going on preventing them from being saved there. Thanks for the tip about swapping to Thickbox. It's work for me, just switching to the Private download method under admin/settings/file-system. Took me a while to realize I had to go down to the bottom of the field configuration to find the thumbnail option. Just one minor point - some people might be confused by this bit: "Now under /node/add/image we can add an image to go in to our gallery." Still, really well written. Author should be very proud of this work. A real benefit to the Drupal community. Hi Admin well i'm new to drupal!! There must be a problem with your view as none of the images are showing up at all even in the code. Great tutorial. It works for the most part. My only issue is the grid is layed out in a 4xX format. The images get put in all different spots. I'm not sure why this is. I can send you a link to see, but I don't want it in this thread forever. So I didnt put here. From memory the Views "Grid"
From memory the Views "Grid" view uses tables and can change column sizes depending on image sizes, text etc so it would be best to use CSS in your theme to make each column 25% of the table. Great tutorial, James. Hope one day I can be as effective helping others gain skill by writing comprehensive tutorials. I am having a slight challenge though. How does one set the path, either for imagecache or Lightbox? Midway through configuring and adding some image content I started to see preview links popping up but all of my links are broken. The above link is for I photo I uploaded named 243. I noticed that Lightbox as a sub-directory did not exist in my tree and manually created it. This did not alleviate the problem. If it makes a difference, I am using Drupal 6.19 with the latest versions of the extensions compatible with 6.x. Should I hunt down the versions you explicitly mention? The Lightbox part of the URL is the imagecache preset, if this isn't being created automatically then your files directory probably isn't enabled, and/or you haven't got Clean URLs enabled which is required. Great! ... Thanks for this tutorial. Thank you so much for the advice!!! It worked for me too! My site currently is in development and I experienced the problem with missing thumbnails. I though that this some sort of bug in Image API. Private uploading method is the solution. i folow your tutorial (great) but i have a probleme, i only see the "title" of "" preview. The thumbnail directory is empty ..
Have you got an idea ? How to implement this Switcher into a node? I have gotten to the part where it says "
Set the Label to Hidden and set both the Teaser and Full node to Lightbox2: thumbnail->lightbox." which i have done but i can't seem to find the part where it says "Now under /node/add/image we can add an image to go in to our gallery. 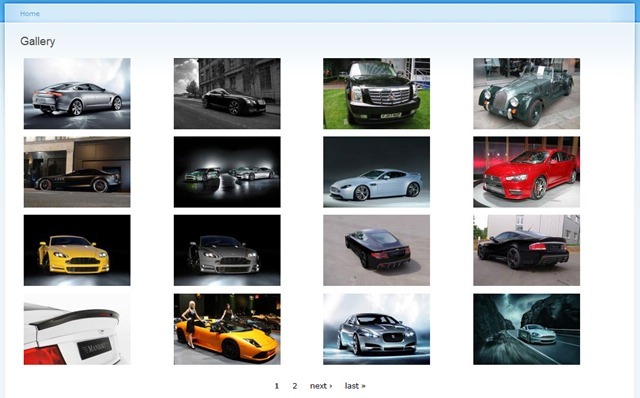 Go to the URL http://www.domain.com/node/add/image, alternatively select Create Content from the Navigation menu. I have reached the point where I was on managing the the fields where you say "set both the Teaser and Full node to Lightbox2: thumbnail->lightbox." My Problem is I could get 'Lightbox2: thumbnail->lightbox.' in the drop down menu so I chose Lightbox image for both Teaser and Full node. When I go forward to upload images I get the following error message. MyAn HTTP error 0 occurred. Am lost on what to do. Ignore the MY at the start of the error message its a typo error. NeverMind I used the 1.9 version n it worked. Had earlier on tried with 1.7 and the latest 1.11. Thank you very much! Your tutorial was very helpfull! I've spoiled few days trying to make gallery for my site and now its working! Link images to a page? Just change the image display type on the View. I usually learn best through examples, but they are sometimes hard to find. Luckily this page is here, and it helped me to learn basics of views in a few minutes.